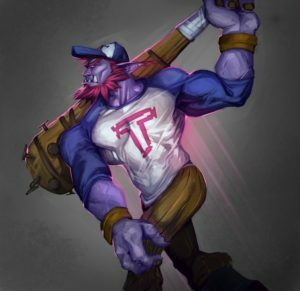 Trundle is a hulking and devious troll with a mischievous streak. There is nothing he can’t beat into submission and bend to his will, not even the ice itself. With his massive, frozen club, he chills his enemies to the core and runs them through with jagged shards of ice. Fiercely territorial, Trundle chases down anyone foolish enough to enter his domain and laughs as they bleed onto the tundra. Trundle’s warband once followed a foolish and cowardly chieftain. 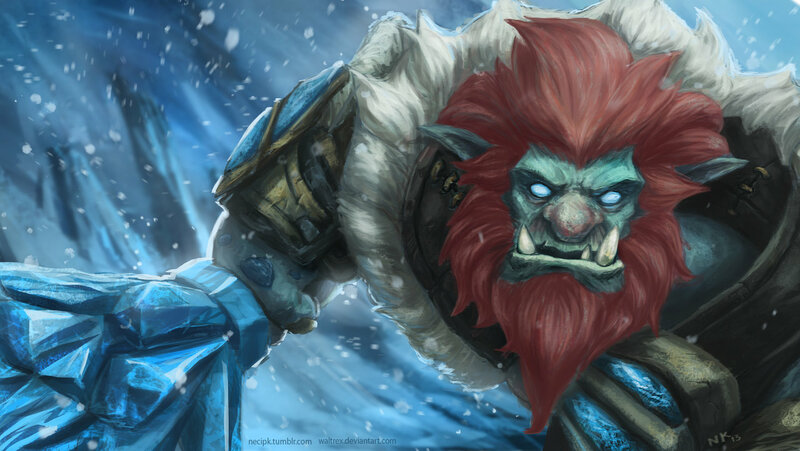 Under such a weak leader, Trundle feared he and his kin would fall prey to the other troll hordes scattered across the tundra. 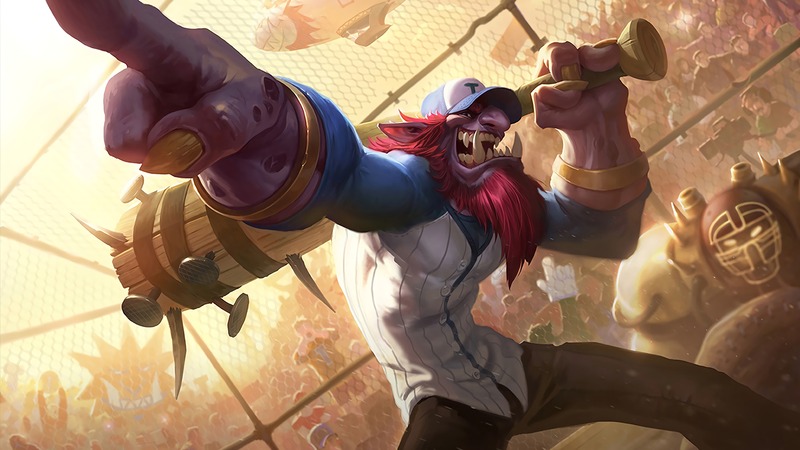 When his challenge to the chieftain ended in humiliation, Trundle did something that wasn’t very troll-like: instead of his fists, he turned to his wits. Thinking on his hairy feet, he spun a tall tale about the troll leaders of old, claiming they wielded weapons of great power as symbols of their right to rule. Though he’d made up the story on the spot, Trundle wagered that if he could find or steal such a weapon, he would become the rightful leader of the warband. The trolls believed him, but none thought him capable of undertaking such a challenge. Knowing the boastful troll would die trying, the foolish chieftain agreed and Trundle departed to the familiar sound of laughter. 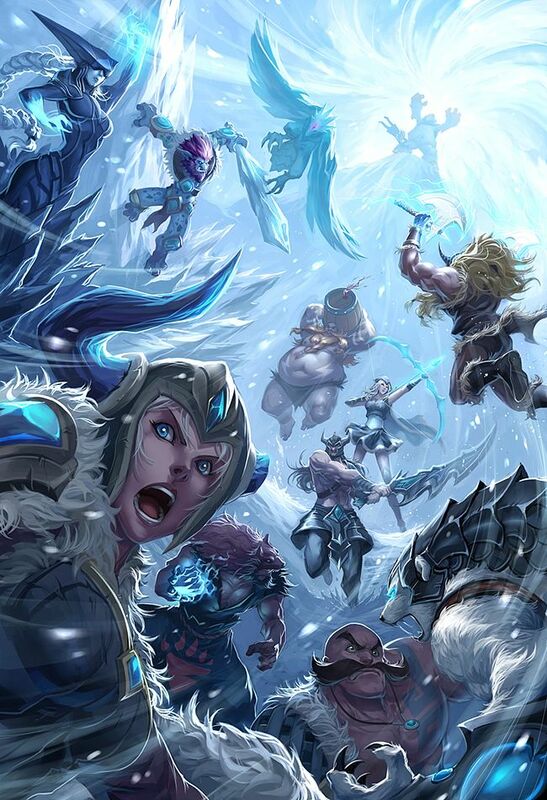 Alone but undaunted, Trundle ventured into the foreboding realm of the dreaded Ice Witch. There, hidden among the many ancient and dangerous secrets, he hoped to find a weapon to prove his elaborate tale. He out-muscled the Ice Witch’s guards and outsmarted her dark magic traps, but nothing he scavenged matched the power he’d described to his kin. Finally, he found an unexpected prize: a huge and magical club of never-melting True Ice. Grasping the weapon, he marveled at the cold power that ran through him. But then the wrathful Ice Witch herself appeared. As she summoned her dark magic, Trundle believed he had met his end, but another clever idea struck him. With a knowing grin, he offered the Ice Witch a devious proposition: a troll army, he told her, would be of much more use to her than one troll corpse…. When Trundle returned to the warband, his fellow trolls bowed to his conquest. Calling his weapon “Boneshiver,” he took a moment to enjoy the look of numb shock on his chieftain’s face before he caved it in. Seizing command, Trundle announced that there would no longer be chieftains – only a Troll King before whom all of his kind would kneel. The trolls rallied behind their brash, new leader and prepared for the coming war. With Trundle leading the charge, the time of the trolls had finally come.